I’ve been working on organizing my scripts to analyze GBS data for my dissertation chapter on the phylogeography of the Olympia oyster. Still a lot of work to do, but here’s a couple of notebooks. All notebooks can be found at my Github under 2016_Notebooks and the scripts referenced in them can be found in my Github’s Scripts repository. GBS_File_Conversions.ipynb: I’m planning on using this notebook to describe various file conversion scripts and code snippets I’ve written to work with. May end up splitting them into separate notebooks, but we’ll see. Currently, it describes how to add population information to the Structure (.str) output from ipyrad/pyrad, whether that be integers (required by the actual Structure program), or strings (useful for programs like Adegenet in R). It also describes how to take a .geno or .str file and split it up into many .geno files for looking at pairwise Fst and nucleotide diversity in R.
Exploring_GBS_Data_With_R.ipynb: This notebook has snippets of code used to explore pairwise Fst and nucleotide diversity (pi). Will eventually expand to include other R-based analysis methods. Playing around with some data on protoshell length taken by Ryann (PSRF intern) from the salinity experiment. Indicates that the means of protoshell length are significantly different (yay!). Very significant p-value between Hood Canal and Oyster Bay. Thought I’d be switching my online notebook over to the Open Notebook Science network, but when trying to write this post I found that I could not add a new category. Will try to figure that out, but until then will keep posting here. Took my samples and reagents from the freezer in my lab on campus to the Pritzker DNA Lab at the Field Museum, where I do the bulk of my molecular work. Spent the day alternating between writing my Doctoral Dissertation Improvement Grant (DDIG) and some lab work. Extracted DNA from 14 broodstock samples using the EZNA Mollusc kit (protocol here). Left to digest for 2.5 hours. Ran out a gel from the DNA extractions of larvae samples done on 8/11/12 at Manchester. The computer hooked up to the UV camera wouldn’t recognize a USB drive, so I just have a phone picture of a printed out picture for now. 12 and 13 are cut off, but they did not show up on gel. 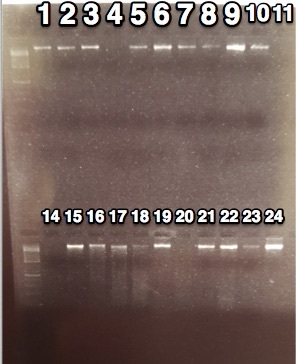 For gels of DNA extracts, I give a ranking from 1 (did not work at all) to 5 (bright band of high molecular weight DNA). These are put of the Sample Master Sheet. Looked at larvae release from each population across time. Did this partially out of burning curiosity and because it would be nice to have some preliminary data to put in my DDIG proposal. Interestingly, the South Sound population produced more larvae earlier. This mirrors the reciprocal transplant experiment, where SS oysters reached their maximum percentage of brooding females sooner at two of the 4 sites. In addition to making libraries for samples from the common garden, I need to start getting DNA ready for one more sequencing run for my project looking at rangewide population structure in Olympia oysters. Did 10 extractions concurrently with the common garden extractions.